Today, 77 percent of enterprises have at least one application on the cloud (IDG State of the Enterprise Cloud, 2018). If you are part of that 77 percent, then cloud is now a critical element of your competitiveness. Heading into 2019, the growing pains of cloud will be cost and security: you’ll face the difficult balance between empowering your teams with the newest cloud technologies and ensuring those teams stay within budgets and comply with organization-wide policies. As you take on this challenge, you need a cloud management platform that provides proactive ways to control and minimize costs, while enforcing governance and security. 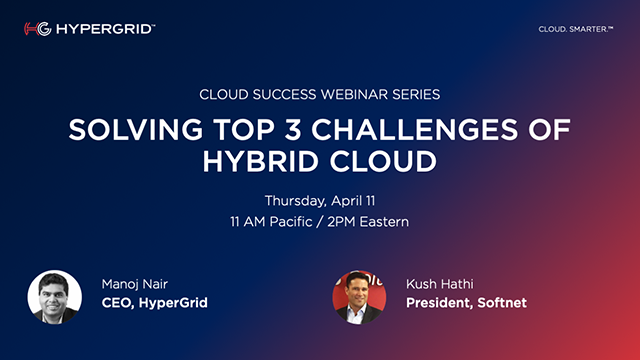 In partnership with LiftOff IT, HyperGrid invites you to attend this webinar and demo, highlighting the capabilities we offer to help you optimally manage and benefit from your cloud strategy. As a webinar participant, you’ll receive a courtesy copy of Gartner’s new landmark overview of the CMP marketplace. Learn why Gartner singled out HyperGrid as the only “visionary” in this category in its Magic Quadrant for Cloud Management Platforms. The public cloud with its unlimited resource, requires higher financial discipline from IT when compared to traditional data center budgeting/spending. Without any cost controls and governance in place, cloud spend could blow past budgets and derail projects. Customer needs to adopt a proactive approach to avoid out of control spend and poor governance, which can result in significant security issues. You will have the opportunity to listen to Burwood Group’s Cloud Architect, James Anderton, on tips and tricks to continuously optimize your cloud, take advantage of new technologies from AWS and get more bang for your AWS buck. Learn how you can kick it up a notch with intelligence, analysis and automation to deliver faster results for new and existing workloads. You’ll also receive a complimentary copy of our e-book that provides valuable insights into how you can optimize your AWS environment while saving 30-50% of your cloud computing costs. HyperGrid is helping enterprises and MSPs master the challenge of managing hybrid and multi-cloud environments as requirements and technologies increase in complexity. HyperGrid’s HyperCloud Intelligent Cloud Platform helps businesses Cloud Smarter by delivering end-to-end visibility, control, and automation. HyperCloud is powered by a predictive analytics engine with 400M+ benchmarked data points, enabling organizations to efficiently plan, migrate, optimize, manage, and scale their cloud operations. Headquartered in San Jose, Calif., HyperGrid supports a diverse global customer base across industry segments including finance, insurance, healthcare, oil & gas, construction, retail, FED/SLED, and telco. For more information, please visit www.hypergrid.com.